If you’ve been wondering how good the next generation of Canadian tennis is, you now have your answer. Less than a week after teenagers Denis Shapovalov and Félix Auger-Aliassime led Canada to a 3-2 win over Slovakia in Davis Cup Qualifiers, 18-year-old Bianca Andreescu has done the same against the Netherlands in Fed Cup. The Mississauga native was absolutely dominant in her first rubber against Richel Hogenkamp and brought that same form into her match against Arantxa Rus, relentlessly dispatching the Dutch team’s No. 1, 6-4, 6-2. Bursting ahead to an early lead against Rus, Andreescu displayed masterful tactics on both defence and offence early on. Looping in high balls and slices when our of position, she was able to work back into points when on the back foot – yet when she had the chance to step in, she did just that, launching into forehands and angled backhands with relentless tenacity. After wrapping up the first set, which saw Andreescu drop serve twice but break her opponent’s serve three times, the second saw her switch into cruise control. 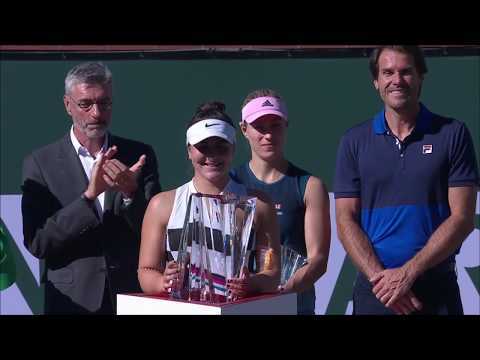 With her tactics working and her opponent flustered (and perhaps drained from an epic three-set loss to Abanda the day prior), Andreescu sprinted to the finish line and securing victory in one hour, nine minutes. The win sees Canada advance to the World Group Play-offs (for the first time since 2015), where they’ll play one of this week’s World Group losers for a to earn a spot in 2020’s World Group – and a chance at claiming the Fed Cup championship.